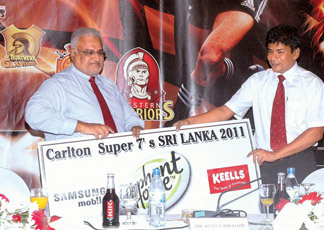 The Carlton Super 7s Rugby Championship 2011 will bring Sri Lankan rugby to a new dimension, when the tournament kicks off its first phase at Nittawela Stadium, Kandy on October 29 and 30. Carlton Sports Club in collaboration with the Sri Lanka Rugby Football Union (SLRFU) will conduct the tournament in a unique format, similar to the Indian Premier League (IPL) cricket championship, turning a new chapter in the world rugby tournament structure. The second phase, including grand finale will be worked off on November 5 and 6 at the Royal Sports Complex grounds, Colombo. This was revealed during a press briefing at the Cinnamon Grand hotel on Thursday. John Keells Consumer Food Sector President Jithendra Gunaratne hands over the Platinum Sponsorship cheque to the Carlton Sports Network Director Ronny Ibrahim. Picture by Saliya Rupasinghe. Carlton Super 7s 2011 is a high-breed version, developed on experience of two successful Carlton 7s rugby tournaments in 2009 and 2010 where the rugby loving public was entertained by 19 international teams in a world class exhibition of rugby 7s. With the main objectives of popularizing the sport throughout the country and setting up a platform for the betterment of local rugby, Carlton Super 7s will consist of nine regional teams and a combined team including international and local junior players. Creating local and international rugby icons with commercial and brand value in the respective provinces and bringing the sport to a professional level are among the other concerns of the organizers. All players and coaches will be fully protected with an insurance cover during the event. The event will set a stage for many young players to showcase their skills and also to share their experiences with world class players. To guarantee this opportunity, organizers made compulsory for each team to field at least a one under 21 local player at any given time. Out of 30 'A' grade international players, a team will be eligible to have three foreign ruggerites where two of them are allowed to play at a time. Adding another step forward, all the ten teams will be coached by experienced international coaches during the tournament. A few of them are USA national sevens coach A.L. Caravelli, Wales national coach Paul John, Former Australian player/coach Chris Roche, Fiji national sevens coach Iliesa Tanivula and Portugal national coach Pedro Fernandes. Elephant House, Samsung mobiles and John Keells Holdings will be the platinum sponsors while Etisalat will be the official Telecommunication Partner for the event. The list of foreign players comprises some big names of the international rugby scene such as Amasio Valance, Nalu Tuigamala, Edwin Cocker, Rocky Khan, Lance Macdonald, Nasi Tuita Vaki, Ben Botica, Naiyabo Masiyasa.